So excited to share this new video featuring one of my favorite healthy go-to dinners in the winter! I like to serve this with Vegan Caesar Salad, Roasted Sweet Potatoes or these herby little gems! Oh man… I came from 4 days in glorious Mexico alone with my husband to the darkest, rainiest Seattle imaginable. Like even for a native Seattleite it’s been bad the last few days! So here I am, going to myself “if it’s really time to get myself together and quit ordering takeout, what am I going to make?? ?” Here is the answer!! 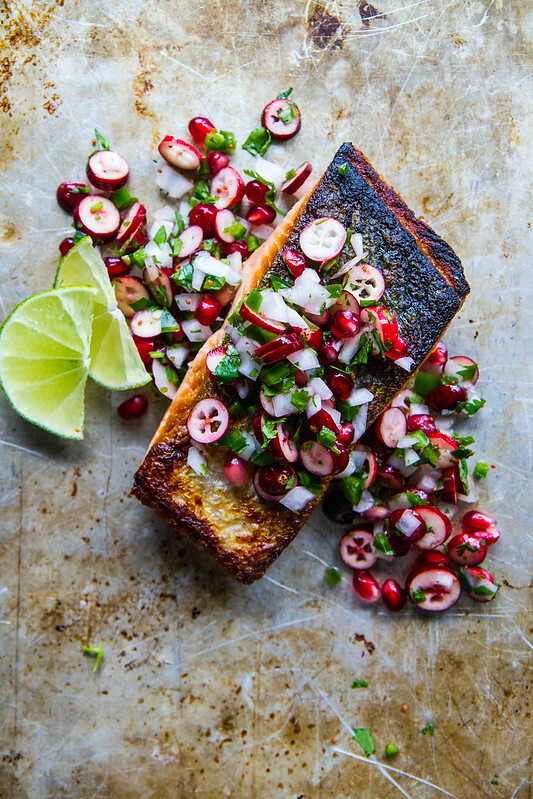 Crispy Salmon with Winter Salsa! I love crispy pan cooked salmon so much- being a Seattle girl, Salmon is just one of my favorite things. And when you put that thick extra crispy skin on a tender, flaky piece of fresh fish, it is truly great. delicious dish perfect for a weeknight, or any special occasion. In a heavy pan or skillet, heat the vegetable oil over medium high heat. Sprinkle the salmon with kosher salt on both sides. Place the salmon skin side down in the pan. Cook without moving for about 3 minutes and then flip over to the skin side up. Cook until crispy on the outside and just cooked through in the center, about 6 minutes total. Gently combine everything in a medium sized bowl and season to taste with a little kosher salt. Spoon the salsa over the hot crispy fish and serve immediately. Looks good Heather and I would LOVE to see how you have decorated your home, I’ve been looking each day hoping to see the decorations. Yes to the Christmas house tour! and even todays recipe looks delicious and quite festive with all those beautiful colors! Love this festive dinner idea! So gorgeous Heather! Love that fruit salsa! So pretty! I love how you mix wonderful recipes with the everyday things going on in your busy life. It reminds me of when my kids were all home (4) adults now & I did everything and had Christmas parties for 75 & cooked everything for the parties. I have no idea how I did it but I did & kept a perfect house & cooked up a storm. Most of the time half of my kids friends were there for dinner & they were in every sport so dinner time was a challenge, but we all ate together at the dinner table. Thank God for crock pots! I miss those days but love hearing about your family & your wonderful recipes. Awww I would’ve loved to see your kids perform! It sounds so adorable!! This salsa looks sooo good with that salmon!!! Yes, please! Yes to this salmon and yes to a virtual tour of your holiday house. Looking forward to it. We are in the middle of constructing our new house right now and all my Christmas decorations are stored in my mother-in-law’s basement, so I won’t be decorating much this year. Yes! I am going to make this salmon for dinner tonight!! I would love to see your decorated house too, Please!!! 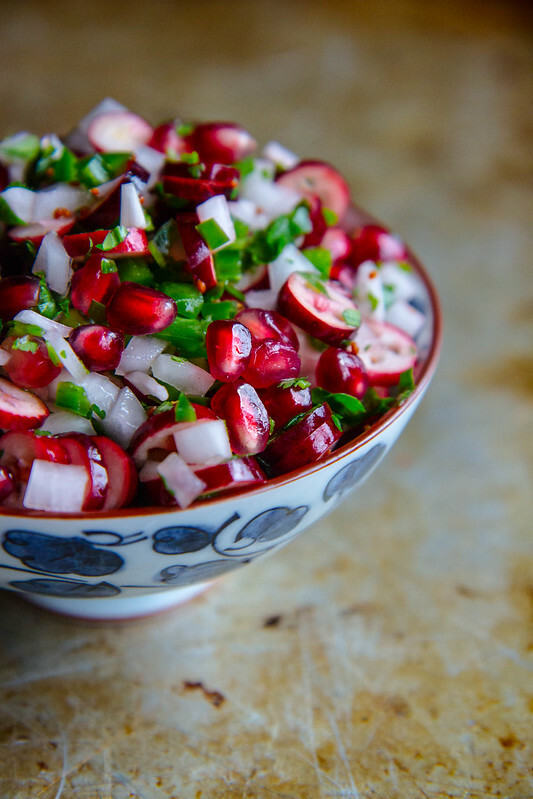 This is such a great dish, the winter fruit salsa looks fantastic! 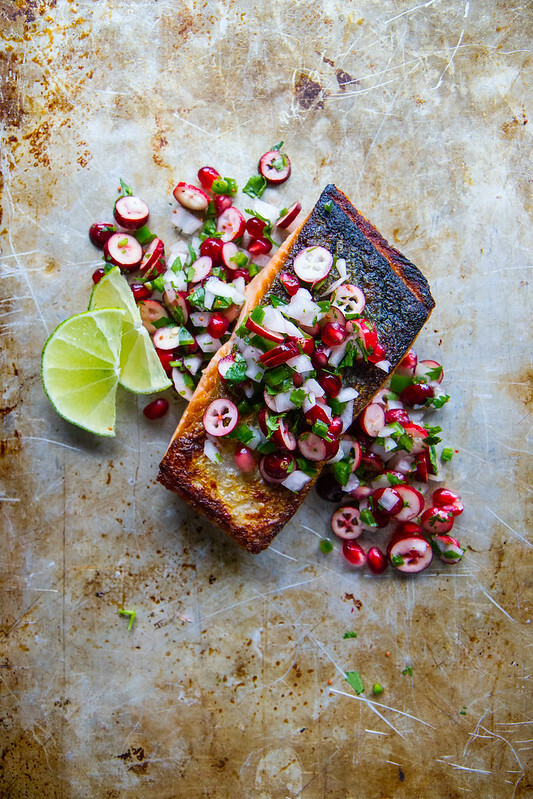 The winter fruit salsa is very beautiful & such a nice contrast to the crispy fish! it’s so refreshing to see something winter-inspired *and* inventive like this. i think fall and winter food has a tendency so get repetitive and feel contrived. love this winter salsa. i’ve never seen the inside of a fresh cranberry before. how weird looking! 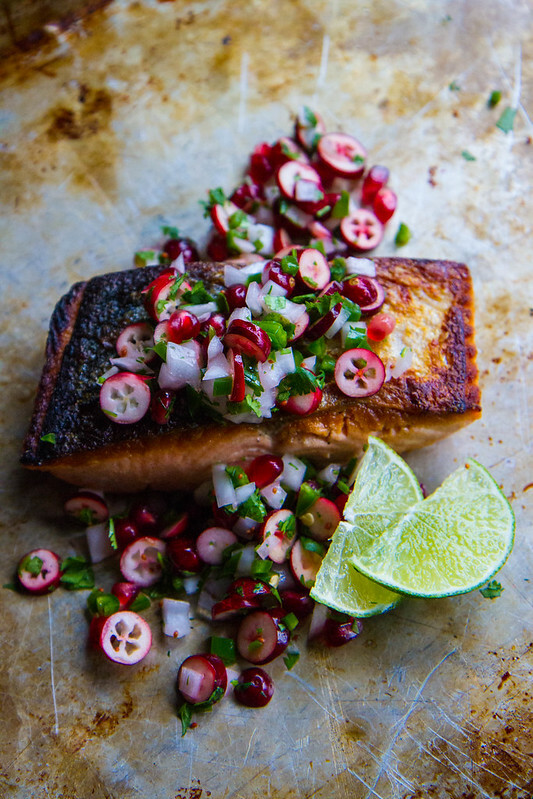 Salmon is a fave in my house too, and this one is so festive, and the sweet/tart salsa is perfect! December 14, 2014 at 7:17 am	 Denizden Babam Çıksa! We loved your cook so much! It gives us a lots of idea! And, we wanted to adapte this cook to our food culture in Turkey and used with different cooking method! I just came across your blog and your recipe for Crispy Salmon with Winter Salsa and I can’t wait to try it! I am a food photographer / blogger and have been looking for a salmon recipe for winter… I’m excited to make this! Thanks for sharing! Can we use the same salsa for grilled salmon? And if yes, how would you season the salmon? Thank you very much! Hi Joy- absolutely you could! I would just drizzle the salmon with olive oil and do a generous kosher salt drizzle and a squeeze of fresh lime! That salmon looks perfectly cooked, I love it!! Love the idea of this winter salsa. I need to try it ASAP. I bet it’s great on chicken, too! Love everything about this salmon! That winter fruit salsa sounds amazing!